Over the years of developing for the web I would run into this problem say, once every other year. Take a look at this piece of code. Have you noticed that for the upper list, there is a space between list items despite I have explicitly declared margin: 0; in their CSS properties? Also, observe that the same spacing doesn’t exist in the list below. 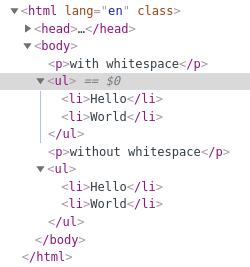 What makes the matter worse, if you open up Chrome’s DevTool and try to inspect the two elements, DevTool’s prettifies the HTML code in DevTool, ending up not showing the difference between the original HTML code.